In this January 20, 2017, file photo, singer Chris Cornell performs at Prophets of Rage and Friends' Anti Inaugural Ball at the Taragram Ballroom in Los Angeles. The late rock singers Chris Cornell and Chester Bennington were honored by Cornell's 12-year-old daughter and the band OneRepublic during a moving and heartfelt live performance Friday. Cornell and Bennington were close friends, and Bennington was the godfather to Chris Cornell's 11-year-old son, Chris. Cornell hanged himself in May. Bennington, who was 41, hanged himself on what would have been Cornell's 53rd birthday last month. Both deaths were ruled suicides. Bennington sang "Hallelujah" at Cornell's funeral, and OneRepublic's Ryan Tedder said that one was of the reasons why they decided to perform the Leonard Cohen track. 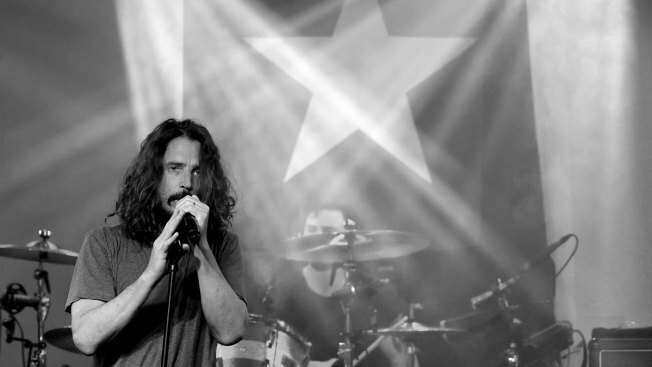 Cornell was a leader of the grunge movement with Seattle-based Soundgarden, with whom he gained critical and commercial acclaim. He also found success outside the band with his solo music and the bands Audioslave and Temple of the Dog. Bennington helped Linkin Park, whose sound mixed rap and rock, become one of the most commercially successful acts in the 2000s. The Grammy-winning group sold more than 10 million copies of its 2000 debut, "Hybrid Theory," which featured the megahit and anthem, "In the End."